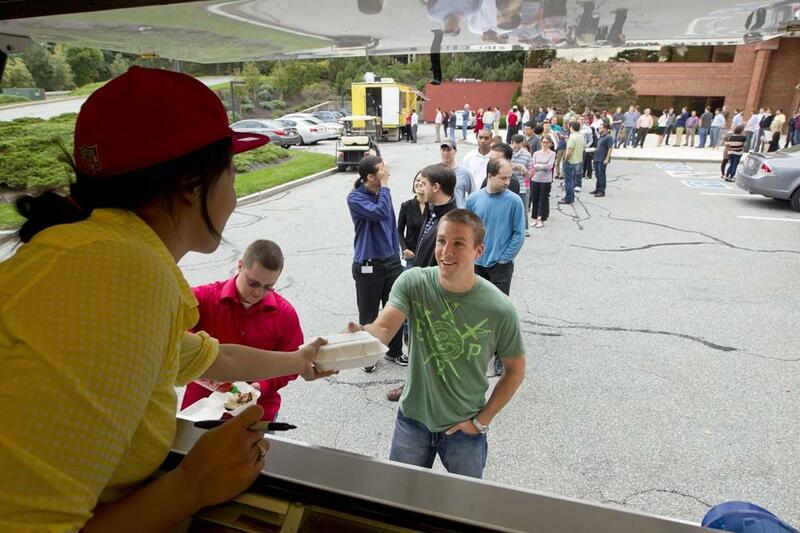 Mei Mei Street Kitchen served lunch at Vistaprint in Lexington last fall. When the current breed of food trucks rolled into town, it was a novelty. Rather than junk food, they were selling creative dishes made from high-quality ingredients. It was exciting simply to be able to purchase a real meal from a truck. Now these vehicles are parked all over, a hallmark of the city, and there is room for discernment. It’s not enough, anymore, to serve gourmet sandwiches or rice bowls or pour-over coffees — they have to be good enough to keep up with other local offerings. And as more food-truck concepts lead to brick-and-mortar establishments, and more brick-and-mortars spawn food trucks, the line between the two blurs. They are all restaurants. Some of them just happen to move. Given that, it’s time to take a critical look at a few of these mobile eateries — old favorites and new arrivals both. A comparison of food trucks selling similar wares makes one thing clear: It is difficult to do well something that can seem fairly simple to the observer. On such a small stage, every detail is easily noticed. One stalwart of the scene, Clover, has an eye for these details. Launched near MIT in 2008, it now has 10 trucks and five stores either open or pending, with more always on the way. Founder Ayr Muir, executive chef Rolando Robledo, and team have an instinctive understanding of how to get people invested in the brand and devoted to the food. Their success stems in part from transparency. Before the first chickpea fritter was sold, the folks behind Clover were blogging about the ins and outs of getting a truck ready for business, from permitting to sourcing ingredients to aesthetics. Philosophies, methods, nutritional information, and internal fracas are all shared online. But people shouldn’t overlook two other offerings. The egg and eggplant sandwich is Clover’s take on sabich, another Middle Eastern sandwich. It also has hummus, tahini, and tomato-cucumber salad. Instead of falafel, though, there are rounds of eggplant topped with slices of creamy-yolked hard-boiled egg. It’s a comforting combination. And Clover’s barbecue sandwich — featuring seitan, or wheat gluten — is meaty without being meat, with an intriguing, mushroom-y texture and a pleasing level of sweetness. (I’m less wild about the tempeh BLT Mayor Tom Menino once sampled.) The menu here is vegetarian, although Clover coyly resists using the term. Clover is a well-oiled machine, but things do occasionally go awry. Someone else gets your order of onion rings after you’ve waited 15 minutes; you receive the wrong sandwich. When a food truck lands in the weeds, the struggle to get out takes place right before your eyes. Too, it would be nice to have another option beyond the whole-wheat pita. Rosemary fries are sometimes too greasy. And the breakfast sandwich — a boiled egg, tomatoes, and cheddar — does nothing for me. I attribute its following to the reasonable price tag of $3. A4 Truck’s breakfast sandwich, on the other hand, is a comparatively steep $6 and worth the price. It comes on a springy English muffin from Area Four, the Cambridge bakery and restaurant that operates the truck. The sandwich features a light, fluffy egg and pleasantly sharp cheddar, but the sweet and spicy sausage patty is what makes it great. Area Four uses beans from Barrington Coffee Roasting Co., and the resulting cup is a pleasure alongside the sandwich, just as good as Clover’s pour-overs. Pastries from Area Four — almond croissants, rhubarb Danishes — are also good. Area Four’s truck is new this season. It is more elusive than the omnipresent Clover, and the menu is more limited. At lunch it specializes in the piadina, a sandwich folded into pressed Italian flatbread. (Perhaps because its flavor profile is more neutral, it is less noticeable than Clover’s wheat pita as a solo bread choice.) One of the best choices is “the classic,” a thirst-inducingly salty but delicious combination of prosciutto and melted, mild cheese, the richness cut by arugula and lemon vinaigrette. The other standout is the kafta, featuring Lebanese-style beef-and-pork sausage, roasted red peppers, lettuce, cilantro, and yogurt sauce. Warm flavors contrast with cooling ones. A sandwich of roasted mushrooms and mushroom puree is too earthy; it needs more of the fontina, gremolata, and arugula to stand up to the mushrooms. 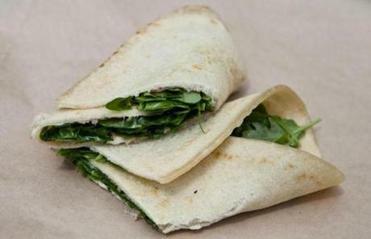 But an asparagus piadina that also includes goat cheese and red onion jam is springy and sweet, a fine meatless option. And the chicken gyro with tzatziki is a lunch-truck classic done well, yuppied up a bit with arugula and green olives. You’ll also find hot dogs from BN Ranch, a salad, chips, and cookies (the chocolate chip I sampled was fairly middle of the road). Aside from coffee, A4 Truck lacks interesting beverage options. Drinks are often what sets one food truck apart from another — witness Clover’s (not quite sweet enough) aguas frescas and herbal lemonades, or Mei Mei Street Kitchen’s Haymaker’s Punch, made with bracing apple vinegar, and Woodsman’s Refresher, iced milk with maple syrup. There is plenty more that sets Mei Mei apart. For instance, the signature Double Awesome, a sandwich of scallion pancakes, poached eggs, and cheddar. (It might be the best hangover cure sold from a truck.) Mei Mei is the project of Mei, Irene, and Andy Li, siblings who since last year have been selling “locally sourced Chinese-American food, made with love.” In addition to scallion pancake sandwiches, this might mean kale salad with rice wine vinaigrette and poached eggs; rice porridge with pulled turkey, ginger, and poached eggs (poached eggs are a Mei Mei staple); beef dumplings with sriracha fried rice; or potato-leek soup garnished with Chinese fried dough and bacon. The food is inventive and wildly vibrant — witness a salad of chewy barley with miso-honey dressing, pickled cranberries, scallions, cilantro, and peanut brittle. The menu changes frequently, with ingredients coming from area farms. The cooks butcher their own sustainably raised meat. They also make classic French macarons in flavors like pink peppercorn. Mei Mei may be the most creative food truck operating. The fare is exciting enough to warrant a restaurant, and indeed the siblings are opening one soon, in Audubon Circle. (With a Kickstarter campaign, they recently raised the money they need to get the space certified sustainable.) I can’t wait to eat at it. A new venture, Fugu Truck, also draws from the culinary traditions of Asia. Chef Bing Liu was born in Harbin, China, and came to the States as a kid. He studied cooking at Le Cordon Bleu in Paris, then worked at the likes of Taillevent, Dovetail, and Corton in New York, and Oishii Boston. He now applies that high-end training to street food. Fugu’s signature item is shaping up to be steamed buns filled with pork — either pieces of tender braised belly or pulled pork with barbecue sauce and cilantro on sweet, white rounds of bread. Both versions are very satisfying. Also good are tacos filled with bulgogi, Korean-style beef, occasionally a bit tough but always flavorful. Also regularly on the menu is bibimbap, a well-rounded lunch with rice, kimchi, vegetables, egg, and a choice of meat or tofu. Noodle salad with peanut or sesame dressing sounds perfect for the hot weather, but it needs more spice; the version I sample is underdressed. By phone, Liu comments on the challenges of keeping food fresh and transporting it on the road. Fugu may still be figuring things out, but it’s one to watch on the local food-truck scene. Whatever the fare, there is one constant at these trucks: warm, wonderful staff members. The Mei Mei team sings and jokes and gifts the occasional macaron to patrons. At Clover, a staffer hands a homeless man a cup of coffee: “This one’s yours,” she says, calling him by name. If any business is only as good as the people who work there, it’s particularly true of food trucks, where those people are always in plain sight. The personal element is a big part of why these trucks are so popular. More businesses are now using them as training wheels for stationary restaurants. When the food pulls off the road, let’s hope the hospitality comes with it.